This week comes news that the castle is continuing to fall apart. The island's preservation trust expects even more of the structure to come down through the winter. Chuck Schumer says he's lobbying the federal Department of the Interior for money to help preserve the building. 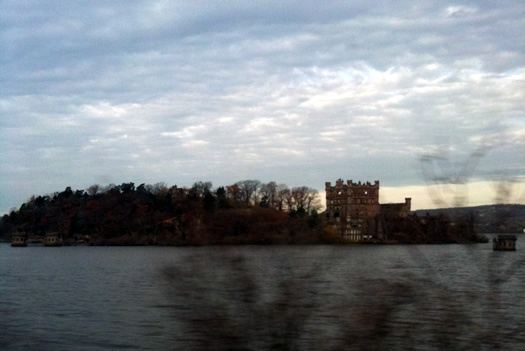 Bannerman's Castle was constructed to serve as a military surplus warehouse during the first part of the 20th Century. It was sold to the state during the 1960s. It's a shame, but most of the castle is probably beyond repair. It was not well built from the day of construction: Mr. Bannerman used cheap cement and reinforced the walls by dumping excess stock such as old bayonets and rifle barrels into the mix. The walls were weakened by fire (which was worsened by decades of spilled powder ground into the wood floors) and explosions as left over munitions went off in the inferno. The structure was compromised even before it was left to the elements. The author of that website you linked to is the co-author of a book about Hudson Valley ruins. It's an amazing book and I recommend it to everyone. One of my favorite parts of that book is where the authors note that the 19th century artists who belonged to the Hudson River School of painters (Thomas Cole, Frederick Church, etc) lamented, in their day, that there weren't any ruins in the Hudson Valley. They had been to Greece and Italy and had cut their teeth on painting the romantic ruins of those fallen empires. Back home they had to settle on painting the romantic natural landscapes in our region. The funny thing is that they'd have a field day painting all the ruins around here today!